I just got a sous vide supreme for christmas and I am super excited to use it. Many of the recipes I have seen online suggest to sear the meat after cooking to provide a crust. No problem. My question is about doneness - If I want a medium rare steak, I would cook it to 125-130. With a sous vide and an after bath sear - should I still cook it to 125, or should I cook it to 115 and let the pan finish cooking it? The searing applied after sous-viding should not be enough to alter the temperature of the meat notably. All you're trying to do with the sear is create the flavorful crust on the outside of a piece of meat via the Maillard reaction, not accomplish any cooking of the interior of the meat itself. This is best done by applying very high heat for a very short amount time, usually just a few seconds. Some like doing this via pan-searing or on a very hot grill, but I usually use a high-powered blowtorch. The important thing is that you not sear for so long that interior of the meat has a chance to notice. A perfectly sous-vided piece of meat should be a uniform color throughout, except for a heavily seared crust. There shouldn't be any gray band of over-cooked meat under the crust. Avoiding that is why you're sous-viding in the first place. Also, I find 125-130°F to be a touch on the rare side. For a good medium rare, 133-135°F gives me better results. The interior temperature will rise when searing after sous vide, though with a blowtorch that effect is probably minimal. With a pan or grill sear, I'd plan for the internal temperature to rise anywhere from a few degrees to 20 degrees or more, depending on the length and conditions of the sear. In that case, a 30-second/side sear in a very hot cast iron pan resulted in an internal temperature rise of 5-7 degrees Fahrenheit in the final meat for steaks that were 3/4-inch to 1-inch thick. A 1.5-inch thick steak experienced almost no temperature difference, but I assume this was measured in the very center of the steak. I've observed similar temperature rises when searing on a grill or in a pan, though I haven't bothered to measure them so accurately. (2) For a more extended sear on a grill, this graph taken from this page can give some useful data. While not technically sous vide, it still uses a "reverse sear" method where a thick steak is warmed in an oven until the internal temperature is 115F and then seared on a grill until the interior rises to 130F, about 5-10 minutes. In this case, both internal temperature rise and carryover were quite significant, with a 2-inch thick steak that spent about 12 minutes on the grill rising from 115 to 130F while on the grill and then continuing to rise to about 145F during resting. Obviously most people don't tend to sear on a hot grill for 12 minutes, but if you like dark or somewhat charred exterior, realize that the extra searing time can result in significant internal temperature rises. If you're just going for a normal sear on a grill, the author of this last page recommends heating thick steaks almost to their serving temperature, which accords with the practice for the fast pan sear with a thick steak above. Still, as can be seen in the graphs, even a very thick steak may rise in temperature by 5 degrees or more during even a moderately fast (5-minute or so total) sear on a grill. In general, the interior temperature rise will depend greatly on how thick the meat is and how long the sear is. And the required length of the sear generally depends on the temperature of the grill or pan or torch being used to sear, as well as the primary methods that heat is conveyed to the meat (conduction, convection, and/or radiative heat). A blowtorch may be able to sear the meat precisely to the exact doneness at each surface area, without the excess heat conduction or convection from a pan or grill, so a much smaller interior temperature rise should be expected (if any at all -- note the comment below on extremely rapid searing). Unfortunately, there's no "formula" for determining precisely how much of an interior rise during searing and during resting will occur, since there are so many variables involved. Only experience can guide you here, but I would always plan for at least some temperature rise myself. This also explains why the temperature fall rate increases after the flip: the upper surface of the steak is now much hotter, and moisture will continue to evaporate off of it at a faster rate than when the raw surface was on top, likely enhanced by convective air currents caused by temperature differentials in various parts of the pan. Once removed from the heat, the steak gradually moves back to equilibrium, allowing residual surface heat to flow back toward the center. If high-temperature searing causing steaks to temporarily cool down internally seems strange, note that precisely the same effect is observed in the graphs on the bottom of second link discussed above (images here and here). These probes were only 1mm into the steak on the side of the cooking surface, and yet they both show a temporary decrease in internal temperature by a few degrees for the first 20-30 seconds or so (after a brief initial temperature burst), which only makes sense if we assume evaporative cooling effects. 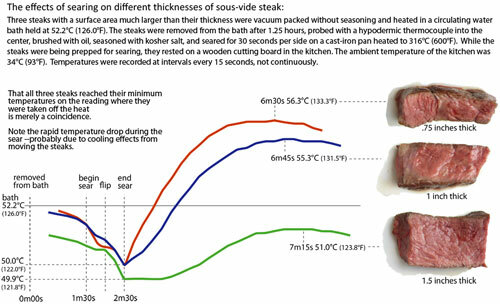 As seen in these graphs, if the first link's steaks were seared longer than 30 seconds or so per side, the surface evaporation rate would quickly slow enough to negate the evaporative cooling effect -- as the dry "gray band" appears -- and the interior temperature would begin to rise during cooking as normal. Not the answer you're looking for? Browse other questions tagged temperature sous-vide or ask your own question.